Ryan Gebhart is the author of the middle-grade novel There Will Be Bears. 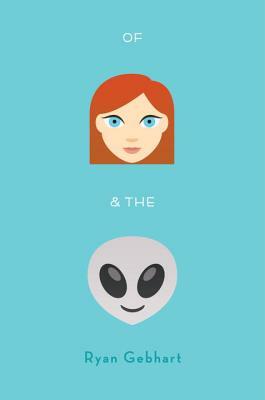 About Of Jenny and the Aliens, he says, “This book is not autobiographical in any way . . . except for that one time I smoked up with an alien.” Ryan Gebhart lives in Ohio. Teens should find his confusion about romantic, fraternal, and familial love relatable, and Gebhart keeps the love story fresh with aliens, interstellar hallucinogens, and surreal imagery, including one long sequence in which Derek follows Karo to Pud 5. Recommended for adventurous YA readers, especially those looking for a realistic teen male voice. Aliens from Alpha Centauri have made first contact, and everyone on Earth is on edge. But amid fears that it’s the end of the world, 17-year-old Derek is focused on his crush, Jenny...As these two storylines intertwine, the juxtaposition of Derek’s dizzying rush into first love and a potential alien invasion touches off some of the same base instincts in Gebhart’s characters. Of Jenny and the Aliens by Ryan Gebhart (There Will Be Bears) is a hilarious and wildly imaginative romp through first love and first contact. Gebhart's characters are realistic and their actions and reactions believable...Gebhart's aliens are a breath of fresh air, particularly Karo and his odd penchant for the Cleveland Browns and all things humanity-related. Gebhart's bold, slightly crude humor is a highlight in this wonderfully entertaining and memorable tale not to be missed.